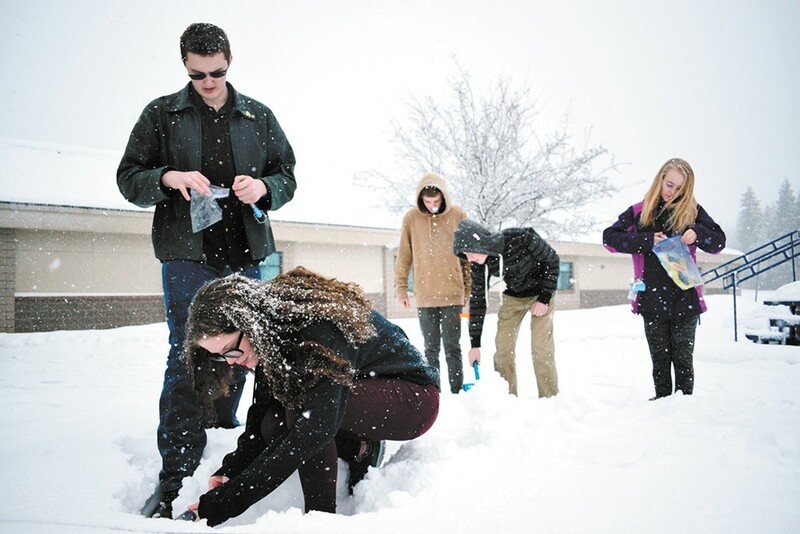 Timberlake High School sophomores Cheyenne Kiecker and Caleb Sorensen (right) watch classmate Logan Jones mark a spot to measure snowpack. In February, Kiecker and her classmates studied the snow at Lookout Pass in North Idaho. She learned how the snow impacts the runoff into streams and rivers and lakes, how it affects the fish and the spring foliage, how it changes the wildfire season. And she's learned that in recent decades, the snowpack in the very spot she and her classmates dug into has trended downward. "It was really interesting to think about how the snow I was looking at impacts everything I deal with on a daily basis," Kiecker says. "I never thought about these kinds of things." The field trip that brought nearly 150 Timberlake High School students up to Lookout Pass is part of a yearlong project that teaches science education in eight different North Idaho schools. It's called "The Confluence Project," an education model developed by University of Idaho graduate students several years ago. Today, more than 300 students in area high schools participate, learning about water-science education from the natural environment surrounding them. And in a state where some politicians have argued human-caused climate change shouldn't be taught in schools, the project has given students the chance to discover it for themselves. "The intent of this program was to show students science," says Jim Ekins, an educator for University of Idaho Extension who helps coordinate the project. "As they become more science literate, it's a whole lot easier to understand the data that supports anthropogenic climate change." When Kiecker and her classmates went up to Lookout Pass in late February, they played the part of hydrologists. With collapsible shovels, the students dug a pit all the way down to the ground. They marked each layer of snow with wooden tongue depressors, extracted a sample from each layer and put it into a plastic bag from which they measured the volume of water. From that, they can determine the snow density. "It really piques an interest for science, to get out there and to see what they really do out in the field," says Timberlake student Logan Jones. Instead of staring at numbers on a screen or in a textbook, the students take part in collecting the numbers. 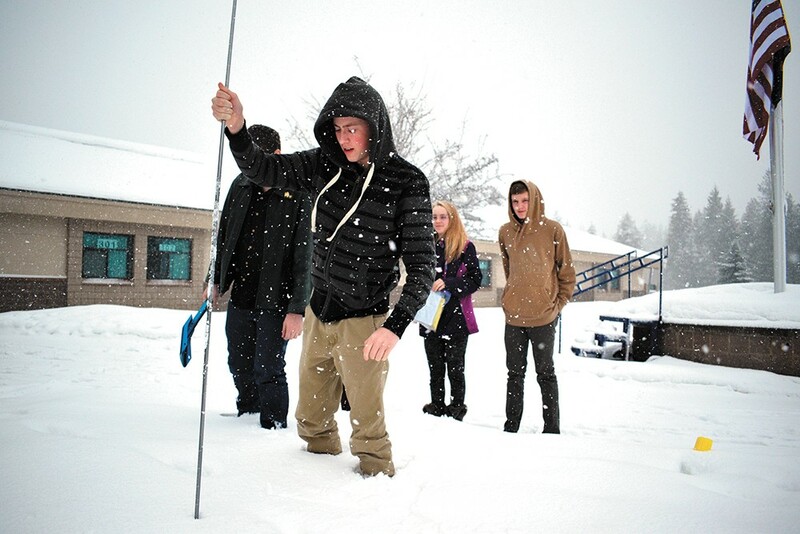 Students Trysta Mitchell and Max Cornell demonstrate how to measure snow density. "You see the data at work, and you see the physical changes as you dig and as you look at it and feel it," says student Max Cornell. Back in the classroom, the students compare their measurements of the snowpack with that of data collected by scientists from sites near where the students collected. When they're done, they put together a graph with numbers from the past 30 years of snowpack data. It shows a gradual line downward, representing a slow decline in average snowpack in the month of February since the 1980s. For the month of April, that line is even steeper. This is the same trend that scientists in North Idaho are studying. Precipitation in the Inland Northwest remains about steady, but it's coming down as rain instead of snow, especially in fall and spring. "There is a clear trend line, and not just at Lookout Pass, but all across the West," Ekins says. There's been debate in the Idaho Legislature in recent years on how to teach climate change to students. Some lawmakers tried to scrub the teaching of human-caused climate change from state science standards, arguing that students should instead come to their own conclusions about global warming instead of it being dictated. Last month, however, the Legislature ended up approving science standards that included curricula on human-caused climate change. Still, according to one Yale study, fewer than half of Idaho adults think global warming is caused by human activities, despite a scientific consensus. Some lawmakers feel both sides of what they call "the debate" around global warming should be taught. But for those involved in The Confluence Project, it's more important to teach kids how to be scientists. That way, says Ekins students understand it in a more "profound way." "Instead of us telling the students what's happening," Ekins says, "The students figure this out on their own." The Confluence Project was started in 2012 with a grant from the National Science Foundation. A group of graduate students at University of Idaho wanted to find an innovative way to teach high school kids, and they thought the kids would be engaged in the natural world around them. It is a cooperative with the Kootenai Environmental Alliance, University of Idaho, Coeur d'Alene Tribe and the Idaho Department of Environmental Quality Lake Management. It's aligned with Next Generation Science Standards and Common Core, but focuses on giving students hands-on experience in the field of watershed science. "Kids really retain more information and get excited when they get outside," says Sharon Bosley, with Kootenai Environmental Alliance. The project culminates with a Youth Water Summit in May, where students present solutions for water resource issues of their choosing. This is Timberlake High School's first year being involved. In addition to the snow field trip, students go on other trips to test for water quality in nearby lakes. Biology teacher Christine Sandahl says as the kids figure out what their Youth Water Summit project will be, they'll branch out. Some students might be interested in a life form they found in a lake, others on invasive species in the water. Sandahl says she wants her students to see how water impacts everything, that they can look at the snowpack and see how it affects the ecosystem, land-use issues, water quality, everything, until it comes out of the tap. "I hope my kids get that everything is really interconnected," Sandahl says. It not only is an effective way to teach climate science, Ekins says, but it develops critical thinking skills in students that they'll need as they go off to college. But perhaps more importantly, Ekins hopes it leads students to seek answers to more questions. "The program is investigative in nature," Ekins says. "We teach students to ask questions, and tell them how to find good, reliable information and data." The original print version of this article was headlined "Show, Don't Tell"